Explanation: Launched in 1989 and looping through the jovian system since late 1995, the voyage of NASA's Galileo spacecraft will soon come to an end. The spacecraft has been targeted to plunge directly into Jupiter this Sunday, September 21st, at about 30 miles per second. Its components will be vaporized in the gas giant's outer atmosphere. 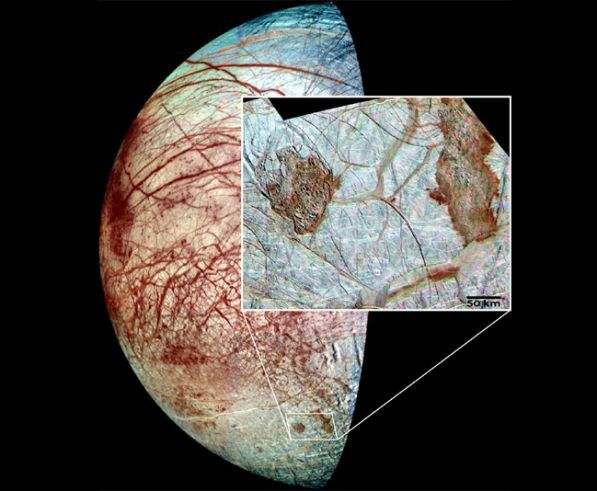 While Galileo's long voyage of exploration has resulted in a spectacular scientific legacy, the spacecraft's ultimate fate is related to perhaps its most tantalizing discovery -- strong evidence for a liquid ocean beneath the frozen surface of Jupiter's moon Europa. Galileo is now almost completely out of fuel for maneuvers, so this intentional collision with Jupiter will prevent any unintentional future collision with Europa and the possibility of contaminating the jovian moon with microbes from Earth hardy enough to survive in interplanetary space. Color image data from the Galileo mission recorded between 1995 and 1998 was used to create this depiction of Europa's cracked and icy surface. The inset shows dark reddish, disrupted regions dubbed Thera and Thrace.